I thought I knew a lot about songwriting when I first got involved with co-writing and writing with other songwriters and producers. I had a transformation of sorts. While helping to write this article together, I discovered the real truth about songwriting. I found out how to write a song without having to feel uncomfortable and feel like I was forcing the issue, plus a heck of a lot more. Here are five simple truths I learned about songwriting, and myself, after being involved with writing songs with other co-writers. When I started in songwriting I got three words of advice from my band member “Go get ‘em.” Most musicians and songwriters seem to think that you can go out there and just write. When that doesn’t work, and you come up short too many times, you start thinking you are no good at songwriting. The simple truth is no one is a natural born songwriter. And songwriting is a learnable skill anyone can master given the right tools, strategies and learning. There are hit songwriters such as Harriet Schrock, Jason Blume, Ralph Murphy who are songwriting teachers that are helping budding songwriters. The first draft of your song may not always be the best. Sure, you have heard hit songs written in just 5 minutes. However, rewriting lyrics and music can be a rewarding experience. Especially if you are not satisfied with your first draft, writing songs is like sculpting a sculpture, a piece of art. Also, when you return to your song an hour or a week later, you’ll have partially forgotten its details—and assuming you documented the draft carefully, that’s a good thing! When I first started songwriting many years ago I had no form. I didn’t know what AABA form or verse, chorus, bridge was. I had no idea what a verse refrain structure was. There was no preparing in advance and no real order to what I would say or how the melody or chords would be. I knew what I wanted to say in the song well enough and could wing it. But since I didn’t have a set way to write, it was hard to learn the various structures for writing a song. I was leaving my songs to chance and letting the many songs go incomplete. 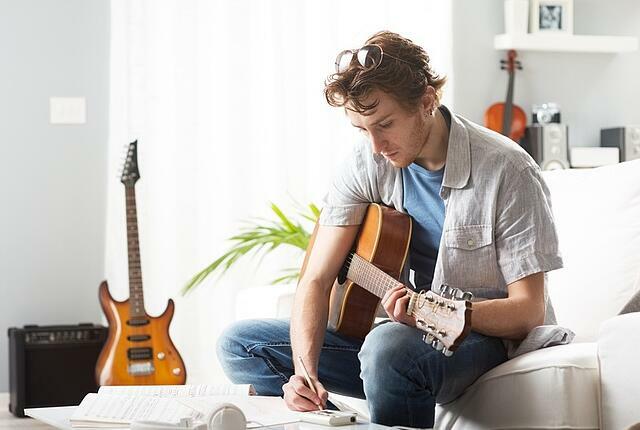 Learning structures of various songs is important – it lets you control the songwriting process so you can steer your lyrics, melody, chord progression, and have a better chance of completing the song. If you learn structures of songwriting, the momentum you build and the objections you eliminate will make your audience eager to hear your song, which makes the songwriting a pleasant and rewarding experience. Also, listening to new songs on the radio can provide sources of inspiration. There were times where I had the dreaded “Songwriters Block” where no music or lyrics were coming from my head. I took a 15 minute break by turning on the radio and Voilà – I had a hook for the chorus! My ideas for the verse, pre-chorus and bridge came quickly and my song was completed within an hour. If you look at the Billboard charts you’ll notice that many of the songs have more than one writer credited. This may not always be as it 1st seems as some of the co-writer’s listed may not have written a single word or a note. In these cases it could be a producer, an A & R manager or an artist who worked a writing credit into the deal with the songwriter. The more famous or well known an artist or producer is, the greater the chance of having a hit song and, therefore, the more leverage they have in getting these kinds of "co-write" deals especially with hungry songwriters. A famous example of this was Elvis Presley who indicated that he wanted to cover Dolly Parton’s song “I Will Always Love You”. Parton was interested until she realized that Presley’s manager expected her to sign over half of the publishing rights. She declined and the rest is history. The song went on to be one of the best selling hits of all time when it was covered by Whitney Houston with Parton keeping all of her royalties. Many of the great songs out there have been written by more than one writer, which goes to show that co-writing can be a fruitful and wonderful thing. If you are looking for co-writing opportunities it’s important to know your strengths. Are you better at the music side of things or are you stronger with the lyrics? Knowing this can help you identify co-writers who have strengths that you may not have, therefore, making it a potentially better match and hopefully avoiding disappointments. If you are able to hook up with writers who are better and more experienced than you, even better. Collaborating with other songwriter’s is a cool thing and definitely worth trying. This is just one of the many fascinating topics that are covered in our past blogs posts.